Can also be used to clear and clean crystals. As an air conditioner, it may help to clear, protect and enhance personal and group environments with positive energies. The first Pomander created by Vicky Wall, the Original White has 49 herbs and essential oils in equal proportions. White or clear light contains all the colours of the rainbow within it. Its function is to clear, balance and protect the whole electromagnetic field and all the chakras. It helps to detoxify, restore and refresh when the environment is polluted - physically, mentally or emotionally. 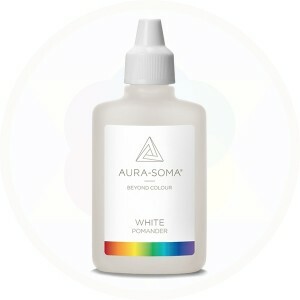 The Original White is also helpful for cleansing quartz crystal.